FA Dan and Sue McDevitt, Dave Gardner, July 1990. 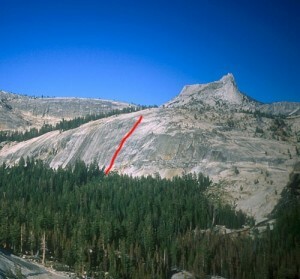 Somewhere near this route (perhaps to the right where one old bolt is about 15 feet up) was a very bold John Bachar free solo first ascent called Edging Skills or Hospital Bills. While it seems that these routes are pretty straightforward if you have strong fingers and good footwork, consider that many holds broke off during the first ascents – making a free solo first ascent even more intimidating. Which SuperTopo guidebooks include a topo for Knobnoxious?